So here’s an 1856 series possibility: 21 essays on “The Lackawanna Valley,” a painting by George Inness. from the collection at the National Gallery of Art (Washington, DC). This was supposed to be a simple advertising piece. The Delaware, Lackawanna and Western Railroad hired George Inness (1825-1894), an ambitious but still unestablished young artist, to promote their company and the railroad industry through his painting skills. People were awed by the power of the awesome new trains but they were scared by them, too. The Delaware, Lackawanna and Western Railroad wanted to reassure people that trains could easily fit into their small town landscapes. They decided to use art to sell the idea that trains are unthreatening. Did Inness believe this? It’s the tensions within the painting that make it especially fascinating. The Delaware, Lackawanna and Western Railroad probably wanted a large-scale Hudson River School-style landscape—but with a train meandering through it, placidly moving through a bucolic scene. Inness gave them an attractive landscape and a handsome train, but then he foregrounded it with a barren field of tree stumps. He seems to suggest that the natural landscape will inevitably fall before the encroaching modern technology. It’s a subtle message that Inness may have hoped to slip by the corporate people. 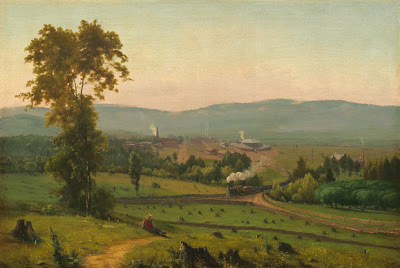 A series on “The Lackawanna Valley” could go many places: to the emerging railroad industry in the mid-19th century, to the schools of painting like the Barbizon School and the Hudson River School that influenced Inness, and to Inness’ slow move toward a more spiritual approach to painting that culminated in the great Tonalist paintings of his later years. I think it would be fun to go deeper into the work of George Inness and explore more fully the world that he painted. Tomorrow, I’ll be proposing the last of these 1856-60 ideas (with no promises that I’ll necessarily be getting to any of them…). But I’m wide open to other suggestions. Any ideas for 1856-60 books, short stories, poems, paintings, songs, or other cultural artifacts that might inspire a good 21 Essays series?